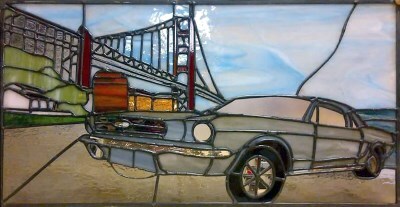 "Mustang at the Golden Gate"
When I create stained glass, one of the most enjoyable things I do is to take a customer's idea and present it to them as a completed panel. I discuss their idea with them, do a little research, consider colors and sometimes review pattern proposals several times. When the project is of considerable interest to the client, it is even more of an honor to be asked to work on it. Since learning to work with Glass Eye 2000, my ability to create these most cherished artworks has advanced substantially. Now I'm confident that my designs will work well and will result in completed projects that my clients will be delighted to have in their homes. 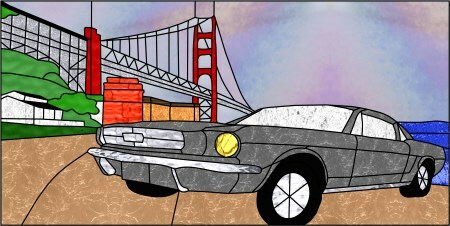 "Mustang at the Golden Gate" started as a request for a Christmas gift, bringing two favorite elements together into one design. My client was specific, supplying me with several photos to work with, and identifying specific areas of each photo that needed to be captured in the completed work. By using Glass Eye 2000, I was able to import each photo into the program and create cartoons of the elements prior to pasting those elements together into a single design. One of the largest advantages of the program is the ability to select specific areas of a pattern, then copy or move them to another area, without causing harm to the original drawing. From there, I can resize that selection and reposition it into the drawing, doing so as many times as necessary until it works. Being able to "draw" straight lines in any direction is another bonus. As with this pattern, the angle of the guide wires in the bridge would have been considerably difficult to do with a pencil drawing; however, the magic of Glass Eye 2000 made this challenge quick and easy. The client accepted my proposal and immediately asked me to create the finished project, expressing how she could easily imagine how it would look because the colors images were so vivid and realistic. Although this gift was supposed to be a surprise, she and the recipient drove nearly three hours to watch me perform the final soldering and patina. I know that I would never have been able to succeed with this project if it were not for Glass Eye 2000! Kim Banks, of Ontario, Canada, has worked with stained glass for more than a dozen years. She began in a small spare bedroom, upgraded to a basement, and eventually into a brick and mortar storefront. She comes alive when challenged by clients and enjoys working with them to create custom orders. She welcomes repair work, in both traditional lead and Tiffany methods. Predominantly using social media, she has delivered many custom orders worldwide, with frequent repeat customers and referrals. She often donates completed pieces to her favorite charity, K9 Crusaders, to help fundraise for rescued animals. 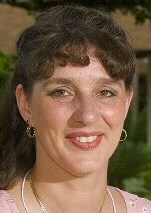 She is in the process of developing a program, with the support of a community outreach organization, to assist community members with disabilities and low income to learn confidence, patience and pride. Please visit her website and Facebook page, and you can even send her an email message.